Hi there! Hope you are all doing well! 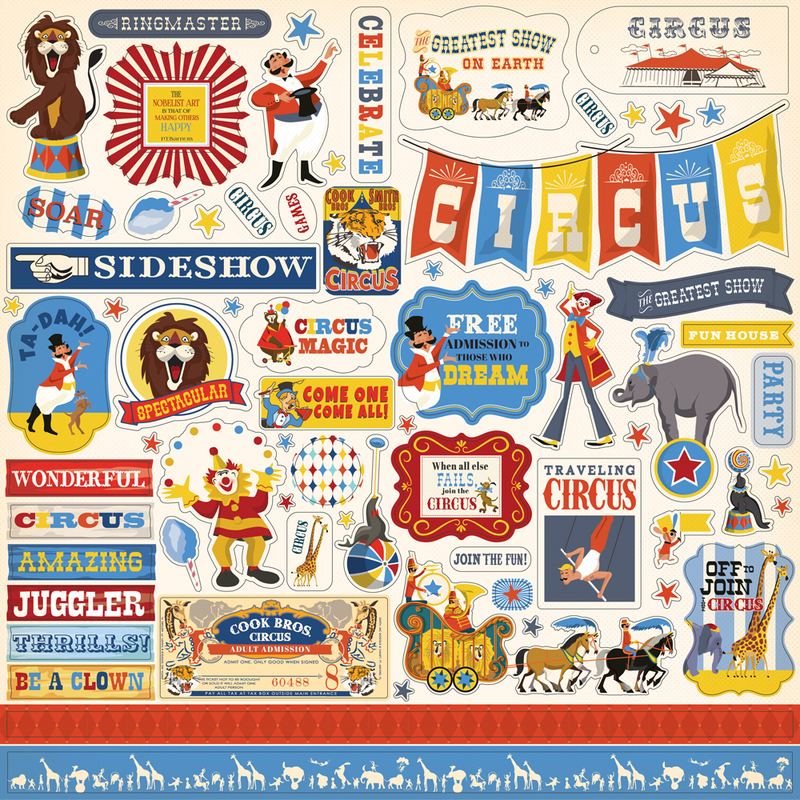 It's Tya up on the blog today sharing a fun party set with the adorable Circus collection. This collection is simply so fun! I loved all the circus themed colors and icons! It made making this set so easy! I chose to do 3 different party favors you could use for a circus themed party. First off is a gift bag. I found a small blue gift bag at the craft store. I cut out a square of yellow and white dot paper from the 6x6 paper pad for the background. I then made a medallion/badge accent on the card using some blue striped pattern paper from the 6x6 paper pad, some chipboard shapes, stickers and Ephemera. I mounted the medallion shape to the front of the bag with some foam tape. I added a few enamel dots as well. I finished the bag off with some blue bakers twine. Next I made a popcorn box from a cut file that I cut out with my Silhouette. I used a 12x12 piece of Join the Circus paper to make the box. The box is decorated with a yellow banner shape cut from some solid yellow paper from the 6x6 paper pad. Then I added a chipboard clown and stars, some more Ephemera and enamel dots as well. I tied a bow on a bag of popcorn with more of the blue bakers twine. The last favors I made were a couple of cupcake wrappers cut from the Greatest Show 12x12 paper and a cut file on my Silhouette. I added some chipboard animals to a plastic stick and added a few word stickers, chipboard stars and enamel dots. I also finished these off with more blue bakers twine. If you have a circus themed party in mind this collection would be so fun to make favors like these ones to give to your party guests. 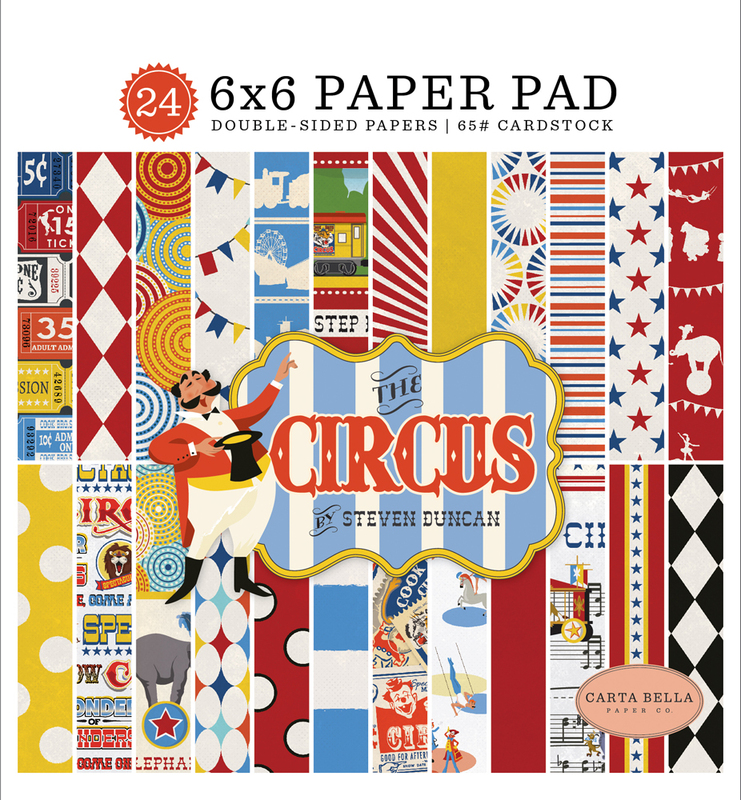 I hope I have inspired you to create some of these fun projects for your next circus party. Thanks for stopping by - Happy crafting! ooohhhh what fun! Loving it!